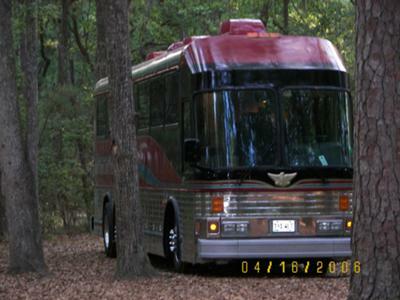 I bought this coach from the state of New Jersey and removed the seats, raised the roof and turned it into a custom bus conversion from 2001 to about 2006. I still have a few things to finish but what a great way to travel! The ex-wife would not support me doing a conversion so she had to go. Me and my handicapped son love traveling in the coach together, Ha! A gallery showing much more of Gregs Work! So sorry about your son. I hope time has helped some. Your bus is beautiful as you did a fantastic job on it and I hope you are using it to the fullest. I appreciate your nice comments. You are right too, it does have a homey feel. It's been a few years since your last commentor, but I thought I would add mine too. Great job on the rig. One of the few that give a sense of home. I am in Carrizozo NM which is just a few hours drive. Thank you so much for your kind words Laura! Your conversion is one of the nicest I have seen. I'm sure your son loved all his travels with you. Sorry to hear of your loss but happy that you have all these wonderful memories. Does anybody have any early 80's, Eagle seats? I appreciate all of the good comments. We are still enjoying the bus at every opportunity. Unfortunately, my son passed away on March 15 at the age of 26. It is just not the same now without him but we are finding our way forward. Enjoy them while you have them guys. Excellent job on conversion! Ex-wife is crazy, she loses out. Hope u and ur son enjoy many happy years. God bless. Nice look on the outside. How about some interior pics? Here is a link to additional pictures! some interior pictures?? Would love to see what you have done on the inside. Nice work! From Eagle Bus to Eagle Motorhome! Sorry to hear your ex didn't like the idea... looks to me like she's missin' out... that's OK... you and your boy will have plenty of good times buildin' memories!